North Jackson, a neighborhood of Jackson, Wyoming, is noted for its close proximity to national parks and its large properties with dramatic views, abundant wildlife and an eclectic collection of gift shops and art galleries. Jackson, a town of around 9,500 residents, sits in northwest Wyoming, surrounded on three sides by mountains. The area is well known as the gateway to Grand Tetons National Park and to Wyoming skiing. North Jackson, Wyoming real estate is located near a host of small art galleries, most of which favor local artists, including Native American artists. Most of these are located along North Cache St. (SR 89) In addition, the area surrounding Town Square in downtown Jackson, features many galleries, gift shops and local sporting goods stores. North Jackson, Wyoming real estate owners will find plenty of places to eat nearby. Virtually all restaurants in this area are locally-owned. You'll have to save your fast food cravings for a trip out of town. Local North Jackson favorites include Trio American Bistro for innovative American fare, Wild Sage for an intimate evening for two, and Nikai Sushi for Japanese cuisine. One of the best things about North Jackson real estate is the abundance of nearby outdoor recreational opportunities. The 310,000-acre Grand Teton National Park is located just north of Jackson and offers abundant hiking and mountain biking trails, rock climbing, fishing and cross-country skiing. In addition, Jackson Hole Mountain Resort, Wyoming's largest and most popular ski area, is just minutes away, and offers skiers the highest vertical rise in the United States. The Teton County Recreation Center is located right in North Jackson and offers an indoor swimming pool, gym, running track and locker rooms. Area golfers will find dozens of public and private courses where they can test their skill, many of which offer the dramatic backdrop of the Teton Mountains. The Snake River, which flows just west of Jackson, is recognized as one of the best fly fishing rivers in the United States. North Jackson, Wyoming real estate is largely upscale and consists almost exclusively of single family homes set on at least an acre of land. Properties in this section of town are noted for their nearness to Grand Teton National Park and the National Elk Refuge. In fact, it's not unusual to see wildlife grazing on properties here. Another plus to this area is that residents frequently enjoy 360-degree views of the Teton, Snake and Gros Ventre Mountain ranges. Although the average home sales price in Jackson was $601,800, North Jackson, Wyoming real estate is generally more expensive. This is because there are few condos in this area and properties here usually include at least several acres. Many properties in North Jackson also feature out-buildings, such as barns or stables. Children in North Jackson attend the schools of the Teton County School District, which also includes Teton Village and Wilson. The district, which has an enrollment of around 2,300 students, operates six elementary schools, a middle school and two high schools. Jackson is also home to the Jackson Hole Community School, a private, college preparatory school, and a branch of the University of Wyoming. St. John's Medical Center, located in northwest Jackson, is the major health care provider in the Jackson area. The center, founded in 1916, offers a wide range of inpatient and outpatient services, including a birthing center, a 108-bed hospital, a wellness clinic and an emergency room. It's not difficult to get around North Jackson. The area provides easy access to State Routes 89, 26 and 191. 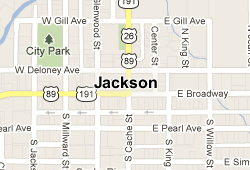 In addition, Southern Teton Area Rapid Transit buses connect North Jackson with downtown Jackson and other areas of the city. The buses also travel to the nearby communities of Teton Village, Teton Valley and Star Valley. For trips further afield, Jackson Hole Airport, located just north of town within Grand Teton National Park, offers non-stop air service to a host of U.S. cities, including Dallas, Houston, Chicago and Atlanta.